AKRacing Octane Series ▷ Size & Buying Guide on GOTURBACK.UK! The Octane series from AKRacing is extremely stylish. The chairs feature is a stunning stripe aesthetic design which adds a modern, sporty feel to it and is made from high-quality PU leather. This is a chair designed for long game-play, in that it is made with comfort in mind, from the comfort of the leather to the new ergonomic design of the armrests, which provide better support when playing. AKRacing is known to make quality gaming chairs while not making the chairs too expensive, and it seems they have lived up to this reputation with this series. So, I can look forward to mammoth gaming sessions? As with every AKRacing chairm you will also receive neck and lumbar pillows, these are great supports when seated over long periods. The design of the chair makes it easy to sit with a straight back, which is great for your posture and means that spending hours on game play doesn’t lead to backache. The backrest on this chair can also tilt back and be locked into place using a lever on the right-hand side of the chair. Cleverley, this has a spring feature which means when you sit back up the chair snaps back into an upright position. I’m not sure how much game playing I could do in a reclined position but I can think of other things I could do using this feature. The chair can also tilt forward up to 12 degrees, I guess this comes in handy during those tense moments in game play, where we all like to get closer to the screen. The Octane chair comes in 6 different colours; black, blue, white, red, green and orange. The available colours actually refer to the stripe design, so if you choose to buy a green chair you are actually buying a black chair with a green pattern, if you buy black you are choosing a plain chair. There are a couple of accessories available to go with this chair. For instance, you can purchase armrest pads to increase comfort even more or caster wheels with a lock function which are great for if you are using pedals in your game. You can also purchase an extended hydraulic lift which can increase the sitting height of the chair by 3 centimetres. The Octane chair is known for being very sturdy, despite not looking like it should be. 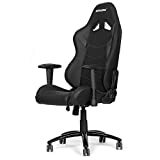 AKRacing claims that the chair can hold up to 150kg, but I find this a tad excessive and would say that the ideal maximum weight for the player’s comfort would be around 90kg. Height wise, the chair would be best suited for someone from around 1.67 meters tall to 1.87 meters.